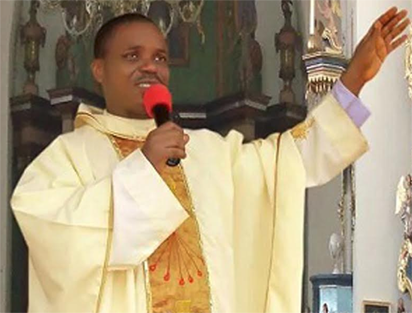 FOUNDER/Spiritual Director of Catholic Adoration of the Holy Spirit and Favoured Children of the Orphanage of the Holy Spirit in Maryland-Egoro Amede, Ekpoma, Edo State, Reverend Father John Damian Adizie was born on February 3, 1975 in Aliko-Oboh in Imo State. He lost his father when he was in JSS 3 and his mother while in the seminary. Life was brutish without parents. At 20, he needed money to enrol for WAEC so he ventured into music and was able to register for GCE with the proceeds of his debut album. He made his papers and immediately proceeded to Carmelite Order, an Order of the Brothers of the Most Blessed Virgin Mary on Mount Carmel who took care of everything, sending him to Nairobi, Kenya where he did his theology. He was ordained at Immaculate Heart Parish in his home town in 2004, the first Carmelite to be ordained there. 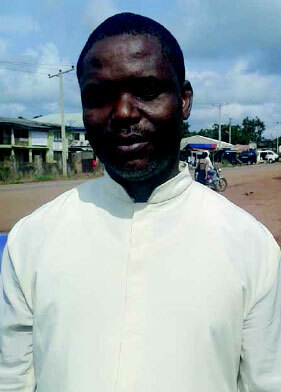 They were many but he was the only one that survived so they gave him the option to choose the venue of his ordination. In appreciation of the divine intervention in his life after the demise of his parents, he entered into a covenant with God, that any orphan that comes his way is a favored child. He found a co-traveller in Ezinne Nneoma Charity Onuoha, co-founder/matron with whom he found the orphanage/rehabilitation home. “That’s why I call the orphans here favored children. Because God favored me through the Carmelite Order, I said I’ll also favor other orphans. That’s what gave rise to the vision and immediately after my ordination, we started a Catholic Adoration of the Holy Spirit. And the first thing God told me was that the ministry would create resources. God gave me various options to choose from and I immediately opted for an orphanage. And He blessed it. The more the children are coming, He keeps taking care of them. Till now, our bank balance has never hit N100,000 but He always provides the means for projects and their feeding. We don’t have agencies funding us but on a daily basis, you see God providing for us. There was one inspiration that came early this year when the leaders started attacking us that we should close down the place. They announced that people should not be coming here for programs because they thought we were getting money from offering. There are two projects He gave us; one is the fishery you saw, another is baking that we have not fully executed. This year we went into radical farming because He knew that eventually when the offering money stops, it will not shake the home. So God already prepared our mind ahead of time. And I must tell you that these people are really trying. When did you decide to go into this ministry? Immediately after my ordination. While I was doing my theology in Kenya, I was equally doing a diploma in print journalism because I have passion for writing. As a seminarian, I was doing what other seminarians could not do because people like to hide their gifts, waiting until after ordination before they explode. For instance, I had a weekly radio program where I invited leaders from different religions in Kenya and we dialogued. When I came back to Nigeria, God inspired me to this ministry. So I chose the youths in the rural area. The vision is to see how we can empower the young people to develop these rural areas. It has not been easy. Why did you have to leave Imo state to come to an evil forest in Edo State? The ministry actually started at Nsukka after my ordination. Transfer brought me to Edo State. I have been posted to several places but Edo State is where we had the opportunity to acquire a permanent site. So we started here in 2006, about one and a half years after my ordination. We went through the elders to acquire this land and they supported us. Orphanage of the Holy Spirit with Uncle Sam. We started at a smaller parish and people were coming in and the priest there was wondering about what was happening. I remember one day we were to hold an all night program and people gathered from different places, but he locked up the church and we were all stranded and confused. That was where the attack started and God showed us this place as an alternative venue because we have already gathered people and we cannot fail them. That was how the idea of this place came about. Our mother of faith helped us and we were able to acquire this land where we started from the scratch. It was an evil forest where villagers and women were not allowed to enter. Our mother of faith happened to be the first woman that entered it. And you started with how many orphans? We started with an orphanage. We announced it to the community, saying if there were stranded children or those who ought to be in school but were not or those without parents, they should be brought to us. And people started coming. As time went on, we got it registered under the Women Affairs and Corporate Affairs Commission, Abuja. We started with one orphan who we nicknamed as Senior Orphan. His name is Victor. He’s now a graduate. God does not give people a load they cannot carry. Today, we have about 98 children. Are you working with the police and other agencies? Exactly. Some police officers have their children here. They didn’t drop any dime. We have so many children on the streets, hawking and selling and nobody cares. These are the ones that will constitute a nuisance in the future. It’s not part of our culture to say let’s help these children or what can we do for these children? How much assistance do you get for the upkeep of the 98 children? There are few. The most common assistance we get come in the form of foodstuffs, noodles, toiletries and fairly used clothings. People have been trying. We have a lot of tissues in our store, but nobody gives us cash. But there are some individuals…like last month a guy came here and celebrated his birthday and brought some food items. Before leaving, he dropped N100,000. It meant a lot. He does that every year. So few individuals like that do visit. The Austrailan Embassy, for instance, erected a hostel for us. There was a time, Total Oil made a donation of N200,000 to the home. Apart from such rare occasions, when it comes to daily running of the home, I will tell you that everything is by divine providence. Now we have to go into farming because I’m looking at the future. I’ve not taken time to calculate what it would cost on a daily or monthly basis. You do such calculations when you have money. We are living totally on divine providence. The need this month may not be the need next month. For instance, a child may not be sick and you will not have to spend anything on medication. Last year we had only five students in the university, but this year we have 12 and 14 seminarians. All these are needs. God tackles them as they arise. Do you know the parents of some of the children? Yes. Some of them. Like I said, there are some that were brought in by their grand-parents who rarely visit but we know that they are there. We keep telling them the children will not remain here forever. We’ll train the ones who are ready to go to school to the highest level after which they will start to fend for themselves or incorporated back to the society. Do you have a program of reconciling them to their biological families? Have you started to give them out for adoption? We have not done that. Edo State is notorious for child trafficking and we don’t want our children to end up in wrong hands. Instead of giving them out and not knowing what becomes of them in the future, we decided to open schools for them: nursery, primary and secondary. Our interest is not to keep them here but make them useful. We have tried it, we sent them to homes to spend holidays and some didn’t like the idea. A child does not belong to one person; a child belongs to the community. You may accept the child, but has the community accepted the child? What happens when you are gone? If it is in the western world, yes. There are so many things involved. So these are the things we consider. So this is a home for them. So when did you introduce the rehabilitation aspect? Rehabilitation came when we discovered that so many young people are unemployed and are depressed. Some of them are roaming the streets and people refer to them as mental people. I’ve been visiting prisons to celebrate with prisoners. One day somebody brought a case and after prayer, she was okay. There was another one, after prayers, he was not healed and we discovered that he needed follow up. In as much people believe that most of these mental cases are spiritual, there are still real cases of mental illness. We now had to partner with doctors and nurses and we set up a standard rehabilitation center which has been approved by relevant authorities. Some of them who were drug addicts, by the time you pull them out from their environment and put them here for a period of time, you see them renouncing those drugs or alcohol. We are running this alongside with the orphanage home and the Adoration Ministry. We have over 50 people there. If you enter this compound, you will not notice that you have people with mental illness here. I don’t know how God does it. He arrests them. No matter how violent they may have been. You don’t have a parish now? No! This ministry is my main apostolate. What are the major challenges you have? The misunderstanding has always been there from my fellow priests because they see it as something new and they feel I want to break out from the Catholic Church and the church is right to do that. The Bible says test every spirit, but in trying to test the spirit, they often end up testing God. So all these years we have tried to make them know we really mean good but for reasons best known to them, it has not been easy to convince them. They have written all kinds of petitions. There was a time they threatened to expel me from priesthood but I was ready to lose it. In a year, I got three to four transfers. I was transferred from Nsukka to Ekpoma, from Ekpoma back to Nsukka, from Nsukka to Enugu, from Enugu to Ibadan. I got four transfers in one particular year, and these were distractions to see whether I would change my mind. I was obeying. There was a stage where I was told to abandon all these things and go to Ibadan or be expelled and that the order was from Rome. As God would have it, our Superior General came from Rome and the first question he asked: if I had been obedient to all the processes imposed on me and they said yes. The man was surprised that a man you say is a rebel could do this. So he commanded them to allow me do my ministry and it was put in writing. And that is the highest authority. Immediately after the approval, those in Nigeria started saying stop and then I said no. Recently, they sent some delegates to come and warn community leaders, asking them why they should attend an all night programme? They just have this mind that if they stop the people from bringing their offering, the whole place will die a natural death. Some men of God believe that any ministry you are doing is all about money. So that’s the only challenge we have. How I wish people will just mind their business. We are not dragging anything with them. That is why we are in this village. Have you made an attempt to explain this vision to your bishop? Series of times. In fact the last one, I kept pleading with him but he said no. I brought a Monsignor here for a retreat and he so much believed in what we are doing and encouraged us. After the retreat, I took him to my lordship to introduce him, but my bishop misunderstood the whole thing. He said so now I am reporting him to people and want to show him that I have a Monsignor. He was now talking and talking. I don’t know when I said something that got him more angry. I said ‘My Lord remember this ministry was here before you were ordained bishop’. He felt insulted. He rang a bell and the receptionist came and he said the young priests should come and bundle me out of his office. This is a man I so much love, we were friends. I don’t know what he must have been told. He has never visited this place. There was a time he told me he sent three priests to inspect this place and they told him the place is nothing to write home about. I asked and found that nobody came and I told him the priests were lying and he said I was accusing him of telling lies. As God would have it, one of the priests he sent was passing and he called him and said ‘were you not among those I sent to visit the place,’ he said yes but the parish priest instructed them not to go. So the report they gave was what the parish priest gave. Instead of him to now stand as a shepherd, he said even at that, he has said what he had said and that I should leave his diocese. I knew that this man had made up his mind. He just sent those people to fulfil all righteousness. So that was the last day I visited his office because he said he did not want to see my face again. What advice do you have for Nigerians? A tree cannot make a forest. We can’t do it alone. We have made a statement and we want others to key into this. Let’s help the young people no matter where they are. This is not the only place where we have orphans or mental people. If you want to partner with this ministry, you are free to do so. We want to establish this vision in different parts of the state. We want to expand to greater heights. We have financial challenges. The greatest support we need is to empower these seminarians so that they will help us carry this vision to a greater height. 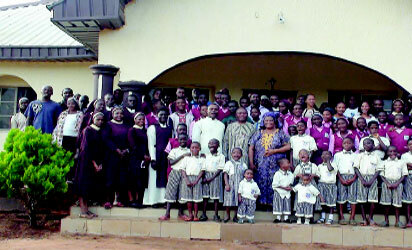 We spend about N250,000 per seminarian and this has been increased recently to N280,000. After training them, I don’t think the burden will be much. We are looking at continuity and sustainability. After training these seminarians, they will be able to help run with the vision. Let’s channel resources into youth empowerment. Those are the major things we need to get the vision to spread. 0 Response to "How I cope with my 98 children — The battles of a Catholic priest serving humanity, Rev Father Damian Adizie"